We all need quick and easy recipes for week nights, don’t we? Even if you don’t work an 8 to 5 office type job, you’re still probably busy every day right up until dinner time. And even though I love to cook, there are days when I just don’t want to have to think very hard about getting supper on the table. I know you can relate. When one of those really busy days rolls around, one of the easiest things to is to put on a pot of water, boil some pasta, and add a sauce. Something quick to cook but delicious and satisfying. Like this Italian Sausage and Rotini. 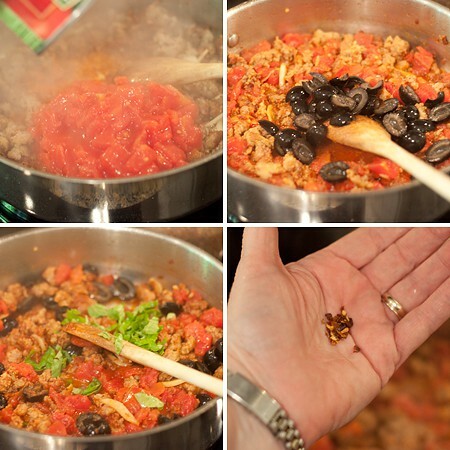 This sauce is just browned Italian sausage with tomatoes, black olives, fresh basil, and a few seasonings. Really nothing fancy, but very pleasing to sit down to after a busy day. Cook the pasta as directed on the package. While the pasta is cooking, proceed with the rest of the recipe. Note: you can use any short cut pasta you like for this. Penne works well as does rigatoni. Even elbow macaroni if that’s what you have on hand! Place a large skillet over medium-high heat. Add the olive oil. 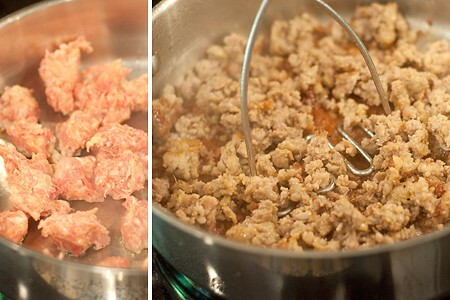 Remove the casings from the sausage and tear it into about 1-inch chunks. Add it to the skillet. Cook and stir breaking up the sausage until almost no pink color remains. A potato masher does a great job of breaking up the sausage while it’s cooking. Add the garlic and cook, covered, stirring occasionally until the garlic has softened.You know, you don’t have to slice the garlic, right? Mince it or crush it…whatever. I just sliced it this time. No real reason. Add the tomatoes with their juice, black olives, basil, red pepper, salt, and pepper. Reduce heat to medium low. Cover and cook for 10-15 minutes or until the tomatoes are nicely softened. Drain the pasta and add to the meat sauce. Stir well to combine. Serve with a sprinkling of Parmesan cheese if desired. 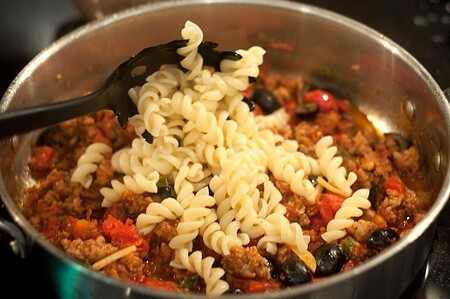 An Italian sausage, tomato, and olive sauce tossed with rotini pasta. Great, quick week night meal. Cook the pasta as directed on the package. While the pasta is cooking, proceed with the rest of the recipe. Place a large skillet over medium-high heat. Add the olive oil. 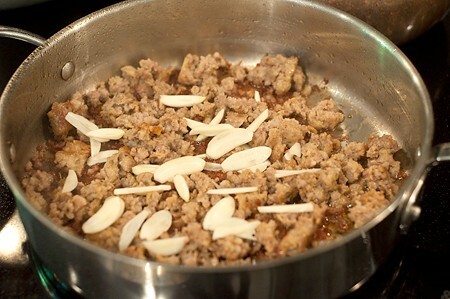 Remove the casings from the sausage and tear it into about 1-inch chunks. Add to the skillet. Cook and stir breaking up the sausage until almost no pink color remains. Add the garlic and cook, covered, stirring occasionally until the garlic has softened. Add the tomatoes with their juice, black olives, basil, red pepper, salt, and pepper. Reduce heat to medium low. Cover and cook for 10-15 minutes or until the tomatoes are nicely softened. Thanks! I’ll make it tonight, in fact. 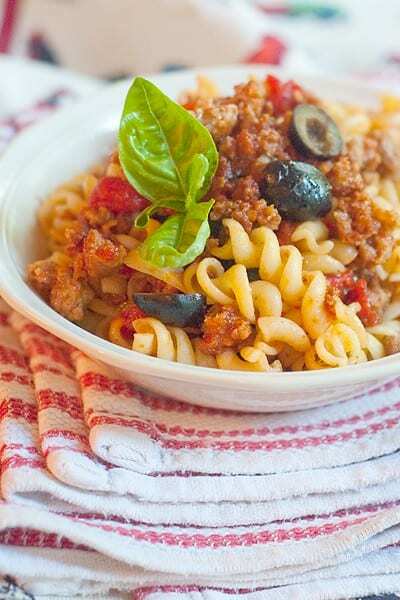 Pasta with sauce is one of my two “go-to” ideas for a busy night. Eggs and toast is the other. Looks like one of those “wonderful for a Friday night, when it’s been a LONG, LONG week” dinners. What a delicious-looking dish!! :) Perfect for after a long day of work! This has to be by far, the finest and tastiest Rotini dish I have cooked in years. I follow the recipe to the tee and my entire family are famished as they smell this dish cooking in our home. Not one iota of this dish survives through to the next day …. read: leftovers…. fine, fine dish.